Beginning January 3, the SJ&P team kicked off the New Year a few miles north in their new home along the St. Johns River on Downtown Jacksonville’s Southbank. 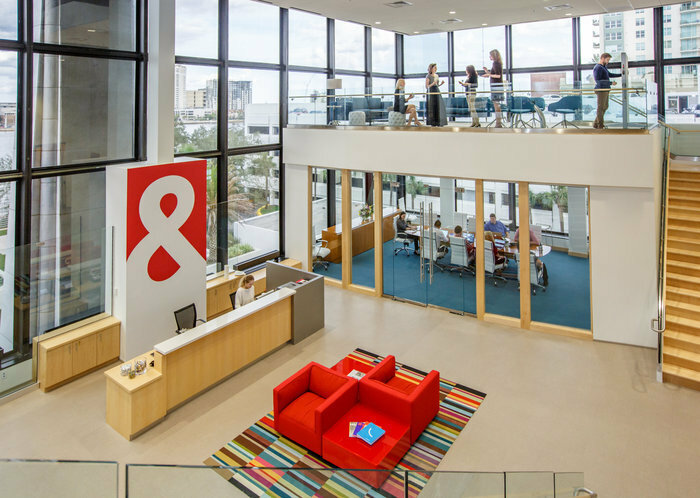 With the move to Riverplace Tower, the 32-year-old agency opened the doors to a new chapter in its future with an inspiring, creative and spacious headquarters that did not disappoint. After an eight-month renovation of the second and third floors of 1301 Riverplace Boulevard, the 31,000-square-foot SJ&P office and former SouthTrust Bank reflects forward-thinking innovation and unique architectural elements that balance the need for private and collaborative space. The office design allows an abundance of natural light and supports varied styles of work reflecting changing technologies and workplace demographics. Upon entering the reception area on the second floor, visitors are greeted with panoramic St. Johns River views through floor-to ceiling windows that soar to 30 feet in height. To take advantage of the unusually high ceiling, a unique, floating staircase was built to connect the second and third floors and a loft was added above the glass boardroom. Historical elements of the building were adopted for modern functionality. 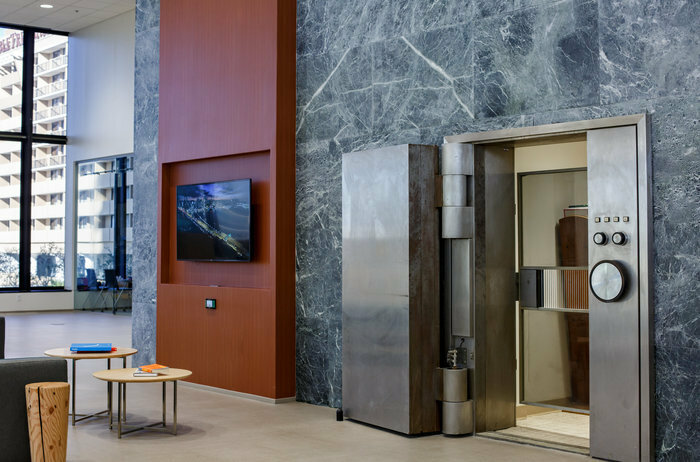 One example, the original SouthTrust Bank vault was kept intact and repurposed as a large, creative collaboration room. 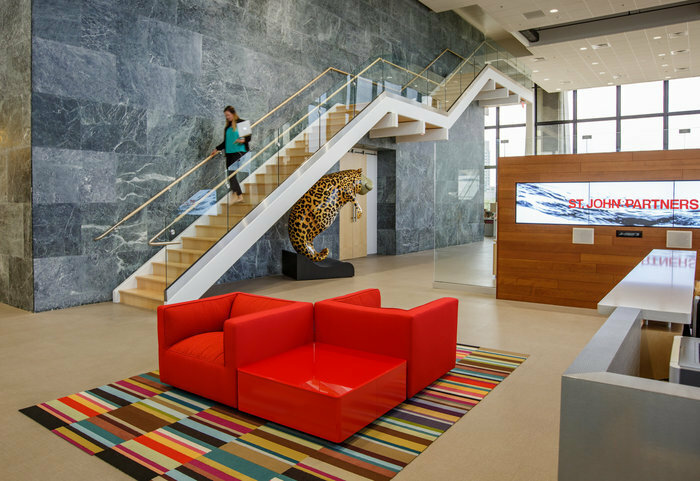 There is so much to explore with SJ&P’s new office – an interactive video wall, a digital lab for testing and development, a social media bar and unique work spaces including stadium seating, booth niches and a 2,450-square-foot café. 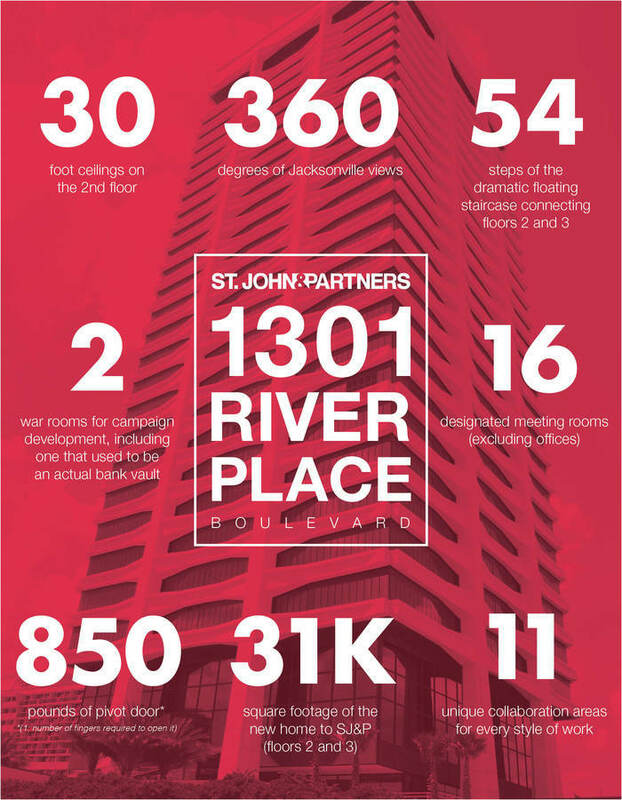 With all of these highlights, at the end of the day our new office provides a place where SJ&P can continue to do what we do best…create excellent work for our clients day in and day out. Here’s to the next 32 years!